There are two main types of heat pumps – air-to-air heat pumps and air-to-water heat pumps. 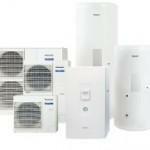 Air source heat pumps like air-to-water and air-to-air heat pump systems work by absorbing heat from the air outside. Although they have much in common, they use the outside air differently, and as such this is what sets one apart from the other. While one technology is used to heat your home, the other boosts the temperature of hot water heating. Comprising of two units, one unit is installed outside to draw air into the home, while the other unit is located inside the home for heat distribution. Heat energy is absorbed by a refrigerant within the air-to-air heat pump unit. The indoor unit heats the liquid into hot air, which is then blown out into the property by the way of fans. These systems use outside air to heat air within a home, which is circulated by fans. They provide heat for your home – even when outside temperatures reach below minus 15° C.
If the system is run in reverse, air-to-air heat pumps can also be used for cooling purposes on hot days. Air-to-air systems enable air to be purified, therefore they can have health benefits, particularly if you suffer from allergies. Product efficiency is around two to three CoP (coefficient of performance). An air-to-water heat pump unit can be installed internally or externally. These heat pumps are connected by pipes which contain antifreeze and water which absorb the heat energy from the air. As heated gases meet water from the wet central heating system, the gas is cooled, turning it back into liquid form. In turn, the water in the central heating system is heated up. Rather than using outside air to provide heat within a home, these systems use outside air to heat and boost the temperature of a wet central heating system. As with other air source heat pumps, they can obtain heat from outside temperatures as low as minus 15° C.
This type of pump ranges from around two to three in terms of CoP product efficiency.